Imagine the fun of capturing a child's first bike ride, a dog's romp through a stream, even just a morning jog, from an epic 170° first person point of view. KeyMission 170 transforms everyday adventures into thrilling first-person 4K Ultra HD videos that can be shared with a compatible smartphone. Its waterproof, freezeproof and shockproof, has built-in Wi-Fi® with Bluetooth®, electronic Vibration Reduction, time lapse, loop recording, includes a remote control and has more than 10 mounting accessories. Bring it everywhere, mount it almost anywhere and share awesome views of your life. 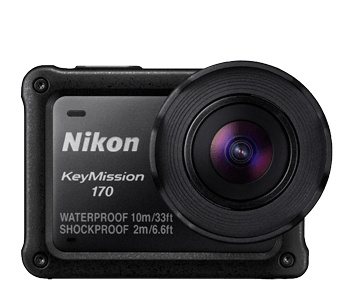 KeyMission 170 is ready to capture life, wherever it may lead. With no additional housing, it's waterproof down to 33-feet, freezeproof to 14°F, shockproof up to a drop of 6.6-feet and resistant to dust and grit. Take it to the beach, water parks, the pool, fishing, skiing, snowboarding, sledding, snorkeling—wherever the action is happening. Add the optional WP-AA1 Waterproof Housing, and KeyMission 170 can go as deep as 131-feet, perfect for SCUBA diving trips. KeyMission 170 makes it easy to take beautiful photos and video, thanks to its intuitive menu and controls. Check your view and easily change settings using the built-in LCD screen. The supplied ML-L6 Remote Control enables shooting even in the heat of the action or while wearing gloves—start and stop recording and tag highlights to help with editing later. You can even use your smartphone as a remote monitor for KeyMission 170. Videos and photos from KeyMission 170 can be viewed, edited and shared with a compatible smartphone and the SnapBridge 360/170 app. The app maintains a connection with KeyMission 170, giving you the power to set up the camera, shoot remotely, change settings and automatically transfer and share photos, all from a smartphone. KeyMission 170 can be mounted just about anywhere. It includes a standard 1/4-inch socket for attaching to existing accessories, and Nikon offers more than 10 mounting accessories: adhesive and suction mounts, helmet and wrist straps, a chest harness, KeyMission extension arm, handy grip and more. Use the supplied remote control to tag moments as highlights while they are happening. This makes editing so much easier, when you can quickly find all of your great moments. You can also combine all of your tagged moments into one epic video—a personal highlight reel. With KeyMission 170, you can get really creative. Transform a long action sequence—like a bike ride on your favorite trail—into a thrilling time-lapse movie, or set Loop Recording to a time interval (from 5 minutes to 60 minutes) and capture short clips continuously. This camera’s built-in Wi-Fi® capability can only be used with a compatible iPhone®, iPad®, and/or iPod touch® or smart devices running on the Android™ operating system. The Nikon SnapBridge 360/170 application must be installed on the device before it can be used with this camera. Android 7 or later is not supported. An update will be issued when compatibility has been confirmed. There is no guarantee that this app will run on all Android devices. iOS 8.4 or later, iOS 9.1 or later (latest version of iOS 8 or iOS 9 recommended) plus iOS 10.2 for KeyMission 360. The KeyMission 360 firmware must be updated to ensure compatibility with iOS 10.2. As of December 2016, KeyMission 170 camera is not guaranteed to work with iOS 10. As for KeyMission 170 firmware, more time is needed to check and verify connection stability. We will announce the release of KeyMission 170 firmware compatible with iOS 10.2 once a date has been decided. There is no guarantee that this app will run on all devices. All measurements are performed in conformity with Camera and Imaging Products Association (CIPA) standards or guidelines. 1. Battery life does not reflect the use of SnapBridge and may vary with the conditions of use, including temperature, the interval between shots, and the length of time that menus and images are displayed.2. The remaining movie recording time (the amount of time that can be recorded for an individual movie) displayed at the top of the shooting screen depends on the remaining amount of space on the memory card. Recording may end before this limit is reached if the camera temperature becomes elevated.3. Dropped from a height of 200 cm. (6 ft 6 in.) onto a surface of 5 cm. (2 in.) thick plywood (changes in appearance, such as paint peeling off and deformation of the drop shock portion and waterproof performance are not subject to the test).These tests do not guarantee that the camera will be free from damage or trouble under all conditions.